If you ask me you can never have enough floor pillows or poufs. They're perfect for a living room where you need a little extra seating every now and then. Personally there is nothing I like better than flopping down on the floor. It keeps things casual and intimate. I keep seeing these great graphic printed floor poufs in stores everywhere but I haven't been able to bring myself to spend the $200-$500 price tag they often come with. I thought how hard could it be to make my own! The first thing I started with was some inspiration. I've had this photo of Spanish tile steps on my mind and thought the pattern would translate well. My next step was to gather my materials and get to work. I partnered with ScotchBlue™ Painter's Tape for this project and think you're going to love it. 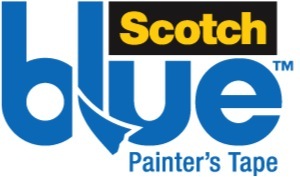 Using a utility knife cut a zig zag pattern into as many layers of ScotchBlue™ Painter's Tape as you can. Tape out the pattern on your cotton canvas. Lay out your two pieces of cut fabric so they form a letter "T". Sew the two pieces together starting with a long side and then continuing with the smaller sides building the box as you go. Invert the fabric so that your seams are completely invisible. On the last seam, sew in a 18 inch zipper. Stuff with polyfill and zip closed! I'm so happy with the way my pattern turned out. I can't believe how much it looks like my inspiration photo. I'm not the only person in the family who seems to like it. The moment I placed it on the floor in our living room my little toddler just couldn't help herself. This project takes a bit of time but it can easily be achieved over a weekend. If sewing isn't your thing you could also take the fabric to a seamstress or upholsterer who would probably do the work fairly cheaply. In total I spent less than $100 to make this floor pouf. Not bad! I'm thinking the next one I make will be for my daughter's bedroom. This post is a collaboration with ScotchBlue™ Painter's Tape Brand. To join the creative community visit ScotchBlue on Facebook, Twitter and Pinterest.